Knife Edge & My Total Ambivalence. I can appreciate a respect for history. And a director who can tread the line between "homage" and "complete, total, rip-off." In fact, I rather like someone who can work within a genre while still offering audiences something new (and possibly noteworthy)! 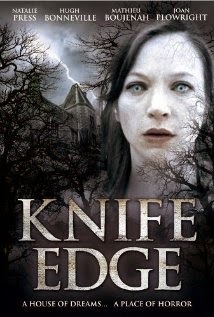 In the case of "Knife Edge", Anthony Hickox stumbles clumsily over that line and back again, sloppily borrowing from "The Shining", "Burnt Offerings", "The Changeling", & (of course) "The Amityville Horror" (just to name the classics!) The result? A movie that looks mighty like a "complete, total, rip-off." But, can you really blame him? Who doesn't love a good gothic tale? Homes haunted by domestic disturbance, people possessed by personal demons & secrets, families torn apart by madness & depravity. Obsession. Paranoia. Back-stabbing. Betrayal. But really... what's new there? These are stories as old as time. Yes. of course I can.